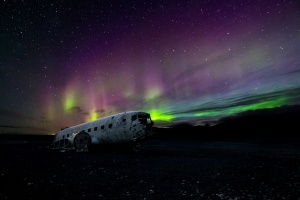 Northern Lights Tour in Winter is full of adventure, icy landscapes and the chance to see the elusive Northern Lights. This unique island in the North Atlantic is one of the world's most sparsely populated countries and has extensive volcanic and geothermal activity. Geologically speaking, Iceland is one of the youngest countries in the world since it only began to rise from the North Atlantic seabed about 25 million years ago. It is the product of volcanic eruptions that are still ongoing. On average, a volcano in Iceland erupts every five years, fortunately rarely where anyone lives. Why not explore the land of fire and ice with guided visits to volcanoes, lava fields, hot springs and magnificent glaciers? During this tour you visit Iceland's most popular sites such as the Golden Circle route, the South coast and Vatnajökull national park. On route you see cascading waterfalls, smoking geysers, colourful volcano craters, a spectacular ice lagoon with floating icebergs and black lava beaches, all set against a backdrop of glistering glaciers and restless geology. Besides, there is always a thrilling potential for the night sky to be decorated with the jewels of the amazing aurora borealis. Imagine the excitement to search for the most spectacular - and natural - light show on earth. Cross your fingers for clear skies, wrap up warm, and don't forget your camera with a tripod when you try to catch sight of the Northern Lights in Iceland. Welcome, your enticing tour of Iceland starts today! The Flybus shuttle brings you from Keflavík International Airport to the accommodation in Reykjavík where you spend the night. 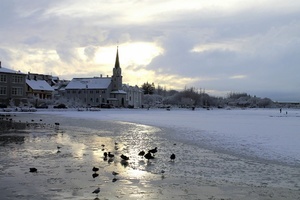 We provide you with ideas how to explore Iceland's capital on your own, dinner suggestions too! Food lovers will be pleased and perhaps even impressed by the number of diverse restaurants in Reykjavík. Many award winning chefs create delicious Icelandic cuisine that is characterized by an imaginative use of local ingredients such as fresh seafood, organic lamb and wild game; but be sure to try the fabulous Icelandic hotdog and pizza too! At 08:30 meet your tour guide and start the escorted tour program with a short introduction to Icelandic geology while watching a striking film at the Reykjavik Volcano House documenting the eruptions of Eyjafjallajökull and Fimmvörðuháls in 2010, which caused millions of people to be stranded worldwide as thousands of flights were canceled. These films give a good insight into the general geology and volcanology of Iceland. At the Volcano House, you can experience a hands-on geological exhibition where you can examine various pieces of pumice, ash, and lava from Icelandic volcanoes. Later on, we depart from Reykjavik and drive to Thingvellir National Park, a UNESCO world heritage site, and where the Althingi, the oldest legislative assembly in the world was founded. This is one of Iceland's most fascinating places both geologically and for the role it plays in the country's history and sense of national identity. Thingvellir is also remarkable for reasons of natural science, as the site is part of a fissure zone running through Iceland, and is situated on the tectonic plate boundaries of the Mid-Atlantic Ridge. The faults and fissures of the area make evident the rifting of the earth's crust. Exploring the hot springs at Geysir is like watching a geography lesson in real life: natural springs bubbling away in the ground until the pressure becomes too much – and they explode in spectacular style. Geysir and Strokkur are the two biggest of the geysers there. While Geysir is no longer active, Strokkur still spouts every 5 to 10 minutes to the delight of visitors. 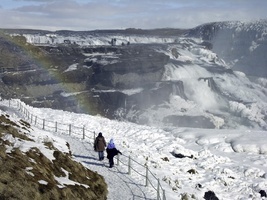 Next, we travel to Gullfoss, "the golden falls", which is a double waterfall that tumbles 34 meters into the Hvítá river. Gullfoss is one of Iceland's most beautiful waterfalls. The explosion crater called Kerið is filled with water and resembles an ancient amphitheater. In the evening, you hear about the Northern Lights from your tour guide. Naturally, once darkness falls, you are out in the garden waiting for the Northern Lights. We will stay for one night in South Iceland. A long drive brings us to a world of glaciers, ice, and icebergs. We travel to Jökulsárlón glacial lagoon filled with floating icebergs. We explore this extraordinary site and perhaps see some seals swimming in the Arctic waters. You can walk on the black sandy beach where large icebergs get stranded. 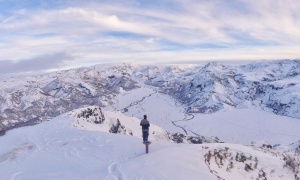 The Vatnajökull National Park is about 12,000 square kilometers and it is the second largest National Park in Europe. In this area, we find Iceland's highest mountains, an alpine environment, and Europe's largest glacier. Tonight you can enjoy a movie presentation about Northern Lights as a part of the Northern Lights educational program. Be careful not to go to bed too soon in this remote and quiet location, or you may just miss out one more chance of seeing the Northern Lights shimmering and dancing across the night sky. We will stay for one night in the Vatnajökull National Park region. Today, we head across the Laki lava field to the village of Vík where we make a photo stop. We take a stroll on the black lava beach and along the bird cliffs at Reynisfjara beach in South Iceland. We pass the glacier Mýrdalsjökull and the infamous volcano Eyjafjallajökull and continue to Skógafoss waterfall which is 62 meters high and belongs to the most impressive waterfalls in the country. Further west we reach the high but narrow Seljalandsfoss waterfall, which is 65 meters high and plunges over the mountain. In the evening you return to Reykjavik for one last night. 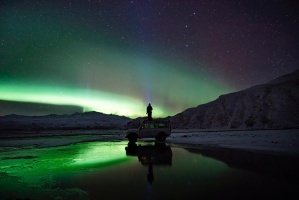 An optional Northern Lights bus tour or fjord cruise can be booked on the spot if the weather conditions are ideal. We will stay for one night in Iceland's capital. Your Iceland tour ends today. Individual transfer by Flybus airport shuttle from your guesthouse accommodation in Reykjavík to Keflavík Airport. Daily driving: Total mileage without airport transfer is 910 km / 564 miles which is an average of 303 km (188 miles) per day, about 4 hours per day will be spent on the bus. On some days the driving might be longer than on some other days. 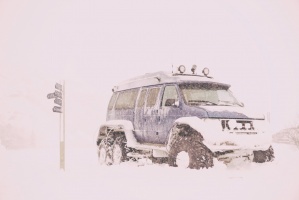 Change Of Program: Itineraries may be subject to change at short notice during severe weather conditions and certain outdoor activities/day trips may be canceled during the winter season in Iceland. 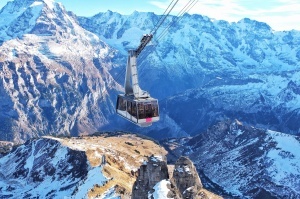 In these rare cases, where situations of force majeure apply, excursions/activities cannot be refunded, but the local guides will try their best to find reasonable alternatives where and whenever possible. In Reykjavik, the dinner is on your own. There are many restaurants for both fast food and a fine a la carte dining in Iceland's capital. In the countryside, a 2-course dinner is included. If you have any special diet requests or allergies, please let us know at the moment of your booking. Lunch stops are made at small country restaurants or petrol station diners.